This fort is situated 90 km from Pune. After the rainy season the earth gains wonderful green look. Such environment is really great to visit forts in Konkan. Near the base of the fort is a temple of goddess �Kurdai�. On the way up, there are remnants of a gateway. Entering by this gateway a Hanuman idol, about 1m in height grabs our attention. Behind this idol we find a natural ghal (groove). This groove can easily accommodate around 100-150 people. Fort has 2 large pinnacles, of which one comprises the Fort top. One can traverse the path around the pinnacle, but it is damaged completely at certain places in between. There are one or two water tanks on the fort. Fort top offers excellent view of entire nearby region. Location of the Kurdugad attaches to it real significance, strategically. A pass called Tamhani ghat, can be easily controlled from here. Besides, it has Raigad and Kokandiva forts on its backside. Half an hour is enough to explore the fort top. The fort can be approached from Pune as well as Mumbai. A way from Pune going towards Konkan passes through Tamhani ghat. An approach is available from Tamhani ghat via Dhamanwal, which goes to fort�s plateau. From Jite town, take a route alongside a water stream. On the way, there is a rock patch having a certain idol on it. Take left from here. The route goes through a farm. It takes 5 minutes walk to start the climb. This route takes us to the plateau after numerous turns. 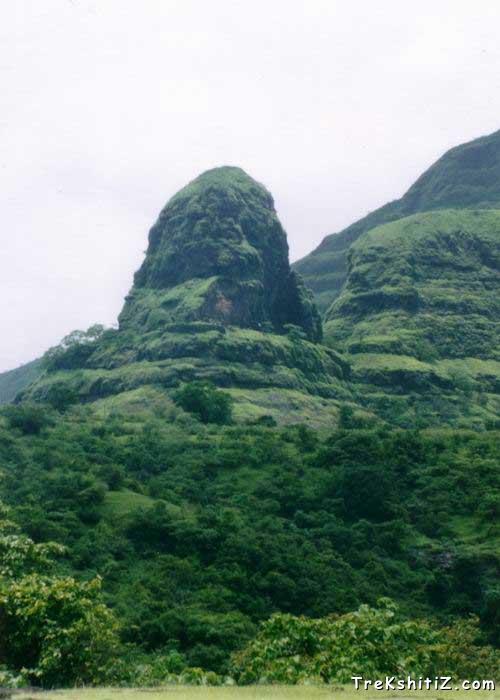 The plateau has a small community by the name Pethwadi. One and half hours would sufficient to reach here from Jite. The route is quite hectic as it drains much energy. The route from Dhamanwadi also reaches here. Pethwadi has a beautiful temple of goddess Kurdai. A water tank lies nearby. A way for the fort starts from the right of the temple. It takes half an hour by this way to reach. From Mumbai reach Mangoan by Konkan railway or ST. Take a bus for Jite, the base village. From Jite, the route is same as above. Groove on the fort can be used for accommodation. One has to make the food arrangements on its own. Perennial water reservoirs are available on the fort. Half an hour from Pethwadi.